KIRSTEN FLIPKENS felt her greater experience was key in her defeat of Katie Boulter to win the Coco Fuzion 100 Southsea Trophy. But the Belgian, who also clinched the doubles title, believes the Brit has a big future. Flipkens, 32, delivered a 6-4, 5-7, 6-3 success over Boulter at Canoe Lake Leisure yesterday. However, the former world number 13 was pushed all the way by the 21-year-old from Leicester. Boulter survived a match point in the second set by serving an ace before going on to level the match. But 2013 Wimbledon semi-finalist Flipkens displayed her extra nous in the final set as she clinched glory. The second seed saluted Boulter but believes her knowhow ultimately proved too much for the world number 144. Flipkens said: ‘It’s obvious Katie is a really big talent and I’m happy for her. ‘I was really confident having had a lot of grass court matches under my belt. ‘I think I had a little bit more experience than her. ‘When I got the break in the third set then I felt it was going in my direction. Katie played really maturely. Even when I was on match point, she hung on. ‘In the second set her serve didn’t give me any chance. 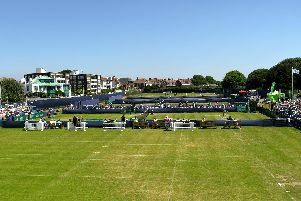 It was the second renewal of the Southsea Trophy. Flipkens and Joanna Larsson beat Alicja Rosolska and Abigail Spears 6-4, 3-6, 11-9 in an exciting doubles final. The Belgian added: ‘It’s a really nice place and the sun has been shining all week.